We like making our customers happy and they often send us letters and emails letting us know what they think of our bags and other products. If you have your own comments, questions, suggestions, or testimonial that you'd like to send us please use the contact information listed on our contact page. We appreciate all input. And photos! "Hello- I just want to thank you for such a great product. I originally got your bag as a bicycle / motorcycle bag, which worked great. But I recently moved to Nome, Alaska where I [do not] bicycle or motorcycle often. 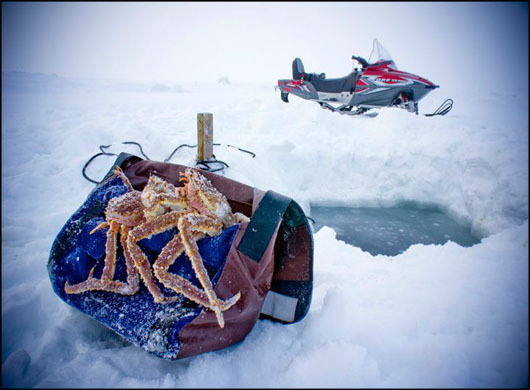 However, I spend a chunk of my week here checking my crab pot under the Bering Sea ice shelf. Every other day I have 3-6 Red King Crabs, which I fit perfectly into your bag (see attached). And the rubber lining makes it easy to wash off when I get home." "Hi Vaya Bags, The whole family loves my dad's new bag. Even our bird Oscar can't stop staring at it. Keep on making beautiful bags because y'all are doing a great job." "I want to let you know how happy I am with your Vaya blue [Medi] bicycle bag. I stumbled on your booth at the Baltimore American Craft Council show. 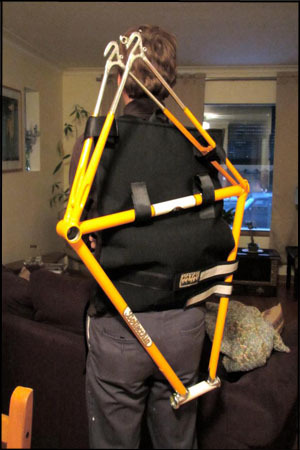 I found the perfect bike messenger bag for me. I have been using it for a while. I really love it. -The medium size is perfect for when I don't use panniers. -The design is well thought out. I really like the way I can quickly lengthen or shorten the strap using the two rings. -Most importantly, other companies make only a left shoulder model. From an old bike accident, I have a an irregular bumpy left collar bone that sticks out making a strap uncomfortable. Mine is a right shouldered model. -Lastly it is so comfortable. Special thanks to to the representative who insisted I buy the padded accessory for the shoulder strap." "Wanted to pass along some photos of an amazing bag/carrier that Vaya Bags made for me, from a simple pencil drawing! I use this 'backpack' to pick [up] and deliver repainted bicycle frames. Much easier than any other method I've tried. Thanks so much, Tia!" "Hi! I just wanted to say, first of all, that I ordered a bag from you 5 years ago for my husband (it's blue and orange, very cool). We have loved it. First, he used it as a bike messenger bag going to work. Then we moved, and it was an awesome travel bag. Then we had kids, and it became his manly diaper bag (all those pockets, vinyl interior, very handy!!) And now I keep trying to steal it for my work bag. So I've decided I deserve my own!" ‎"...well it's been two years since I purchased TWO!!! Vaya bike bags, one tube and one without. I have dragged them through USA and Germany Berlin, also hard winters... pedaled a lot with them on my bike, subways... and yes: they still look just the way when I bought them. So keep up with your work VAYA team and be sure that I will stop by next time I am in the area. I will buy more of your bags! hugs froom overseas!" "Hey, I got this nifty little fella (Vaya Bag) about 3, maybe 4 years ago. And boy is he awesome. I have used him for almost everything imaginable, water proof enough to hold friggin WATER (I did that). Thank you, I'll be hitting you guys up for another in a couple months..."
"It's been a year since I purchased my standard size Vaya recycled bike tube bag. I have dragged it through 1 and a half Maine winters, exploded multiple cans of beer inside of it, pedaled over 1000 miles with it on my back, and it still looks just the way it did when I bought it. Nothing has frayed, torn, broken, or been damaged through all of the abuse, and for this I want to thank Vaya! My girlfriend even complains I wear it too much because I have serious trouble taking it off! It has become a part of me, my next bag will surely be a Vaya, then I will have two fully functional bags that will last me a lifetime!" "I have been buying bags for years in hopes of finding the perfect one. My custom Vaya bag has ended my search! Not only is the design unique, but the way it functions is a dream -- pockets the size I need them, where I need them. Thank you!" "Thanks for the quality bag! I've got the bigger kind, but it still holds its shape well when its loaded up. I especially like all the pockets- you can tell some real thought was put into the construction of the bag. It looks totally pro, but knowing its hand-made really makes it special. Good work!" "The bag is so beautiful, and so well made. Thanks so much for your hard work! I am so exited to give it as a gift tonight." "Vaya bags are made with love and extreme care. I've never had a bag so durable and suitable for exactly what I need. These bags are tough and this one will probably last me a lifetime. I would suggest one to anyone looking for a quality messenger bag, and I do all the time." "After owning endless bags which fell apart within one week of their purchase and which couldn't hold anything bigger than a universal remote, getting a Vaya Bag was like waking up from a very disturbing dream and smelling cinnamon buns baking downstairs... and man do I love cinnamon buns." "It's been scientifically tested and proven that you can fit three 12-packs (cans or bottles) inside a Vaya Bag, and if that isn't quality, I don't know what is." "I love Vaya bags... I once spilled an entire fruit smoothy in mine, and it cleaned out of the inside so easily.... it was great, and now it smells like fresh fruit, which is also great...... I look forward to spilling more things in mine very soon! Best Messenger bag ever created!!!!!" I received my bag today and it is just beautiful! You did a wonderful job making this for me and getting it to me. It's built like a tank so it will last me a lifetime. "Just wanted to say that we're loving the bag, and thank you for doing it so quickly! As you can see, the boys are already taking advantage of what it offers in terms of transporting food and drink..."